Of all the murals this is the largest – 60,000 sq ft. The new buildings were completed in two phases and at the closing of the first phase the Turf Club was concerned as to what to do with all the black asphalt come race season. It was my idea to paint the landscape plan to scale so that guests would see the future plans in real life terms. The news media did a fly by in their helicopter for the evening telecast and the engineers called to congratulate us that we got the fountain spot on centered. How’s that for drafting. 01 Sep	This entry was published on September 1, 2012 at 7:36 pm. 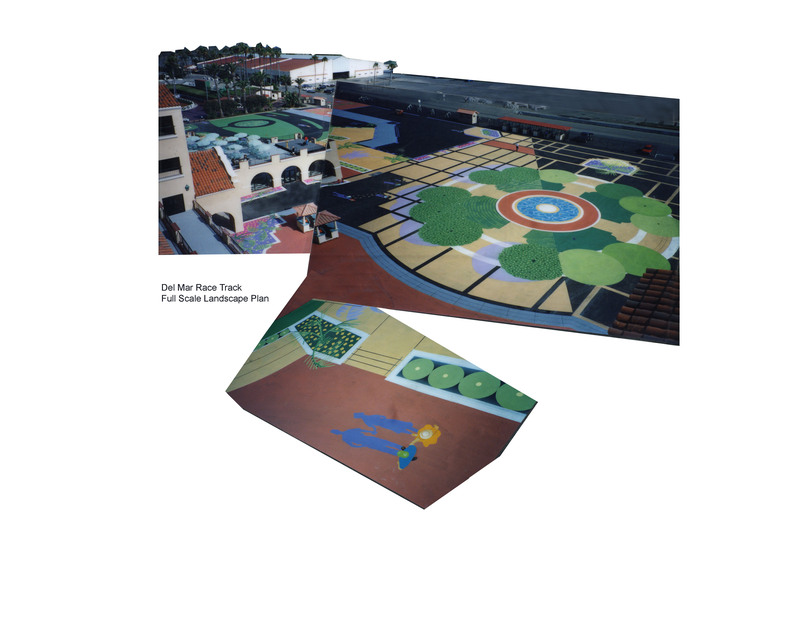 It’s filed under Corporate Art and tagged Del Mar Fairgrounds, Del Mar Racetrack, Del Mar Turf Club, public art, San Diego Murals, Turf Club. Bookmark the permalink. Follow any comments here with the RSS feed for this post.